From last Sunday when I had the pale pink Milo vest completed I’ve been on a slight roll of finishing off wip’s…I know shocking isn’t it ! I can hardly believe I wrote that sentence myself ! First to be finished was the cushion cover I was designing…oh I can’t tell you how much I love this !! I LOVE LOVE LOVE IT !! When I started this cushion I have a picture in my head of what I wanted the front and back to look like and what you see here is exactly what I had in my head !! I can’t believe looking at it that I got the image in my head translated into yarn in front of me ! The front was made up of small granny squares which I joined with wrong sides together so I’d have the raised rows and the back I made in two parts to give me an envelope fold type opening. I then sewed on buttons and gave the edge some button holes. I used Stylecraft Special in a dk weight and a 4mm hook. It is now in pride of place in my crafting corner and it is extremely comfy and cosy behind my back ! 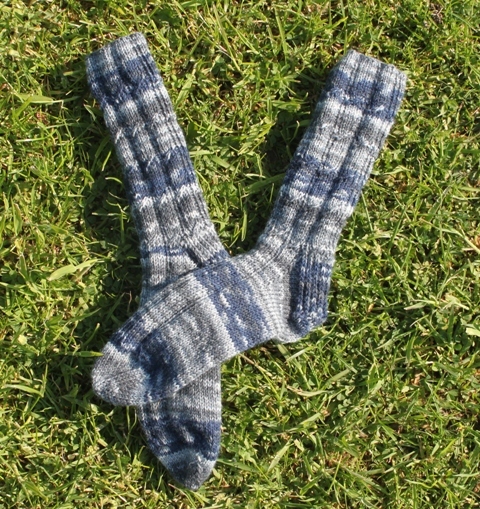 Second onto the FO list were Alans Stormy Sky socks. I took these out Tuesday night to do a few rows on them and got so engrossed that they were finished and off the needles that night. I find this happens me a lot, once I get the time to pick a project up I’ll keep going at it until done, I really just need time ! We have been having such a spell of sunny weather that I was able to photograph these in the garden the other morning at 9am. I used Opal’s Fairies and Elves yarn and 2.5mm dpn’s, my favourite way to knit socks I must admit. On Wednesday I had started a square I was playing around with for a bag for Elizabeth’s birthday and that is so very near complete. It is in crochet and is again out of my head but it should be ready all going well for showing on Sunday’s post so do check back to see that. 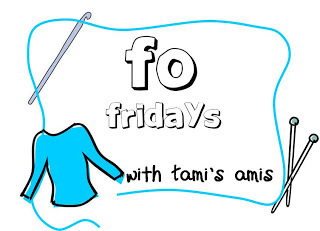 To check other blogs taking part today head over to Tami’s blog. This entry was posted in Crochet, Finished object, Knitting and tagged Cushion Cover, Stormy Sky.. Bookmark the permalink. Why is that, that you want to start something and you dont have the right yarn and or needle !! Frustrating is what it is. Oh I’m delighted you have it on paper, your design that is. I can’t wait to see it. I’ve not designed anything in knitting but I’m having an absolute ball designing in crochet ! Congrats on the great finishes Ruth. You are so amazing. Love it too!!! How cheery is that? I like your socks too-perfect name for the colorway too. I hope Elizabeth is feeling better. I have a sick teenager at home today–called me to get him at school as his tum was feeling a bit sick. I know of others with sick tummy bug kids so it must be going around here again. Sheesh! Summer cannot come fast enough. Have a great Saturday–I am winding down for my Friday night–about ready for pajamas-and it looks like you are probably snoozing away still but about to be up for your Saturday! Hooray!!! The socks are finished. And I love, love your cushion cover!!! Thank you, I just adore the cushion cover and the much awaited socks, I got there in the end lol.